The Klamath Mountains, which include much of NW California, contain at least four belts of accreted terranes, three of which, if you include the Franciscan assemblage, lie in Oregon. In general, the terranes are separated from each other by east-dipping thrust faults and become younger as they approach the coast. Each belt contains several smaller terranes that came together prior to accretion to North America. The Franciscan Assemblage consists of mostly Cretaceous sedimentary rock that was assembled in a subduction zone setting. It consists of the five smaller terranes shown on this map. 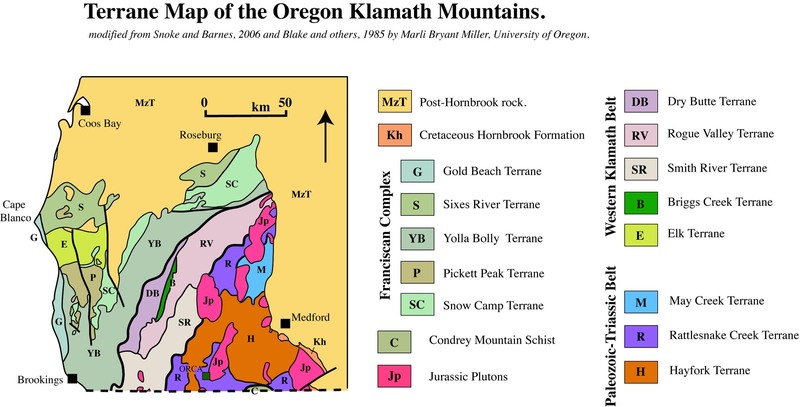 click here to see a map of the Accreted terranes of the Klamath Mountains, as a whole.